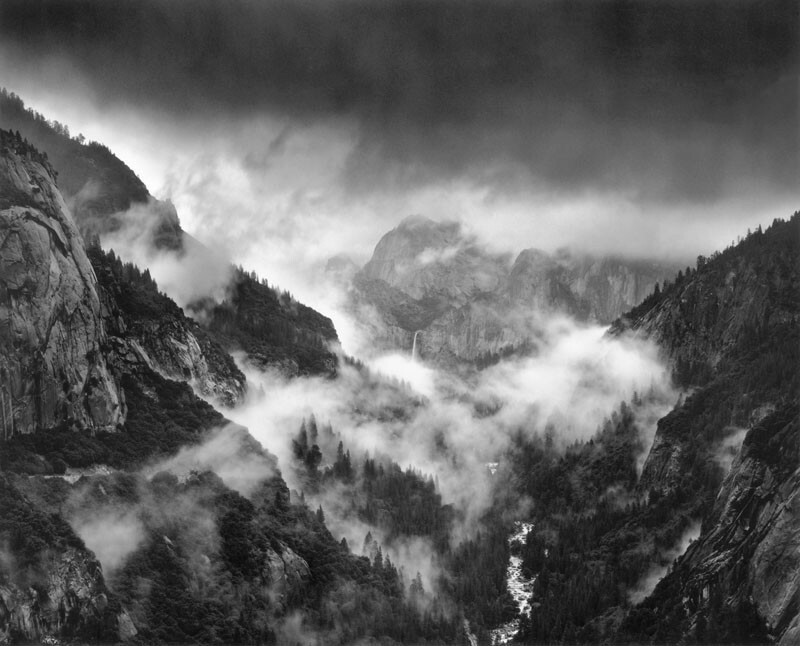 In early July of 1974, I was in Yosemite running the darkroom for Ansel Adams' Making of a Photographic Book workshop. A few days into the workshop, Ansel’s business manager pulled me aside, saying that Ansel was interested in whether I might be willing to move to Carmel and begin full-time work for him as his assistant. I thought about that for maybe a micro-second and agreed to report for duty in early August. A few days later, the entire workshop group headed up to Yosemite's high country, stopping at Olmstead Point, Lake Tenaya, and Touolomne Meadows. During the outing, a summer storm rolled into Yosemite, pouring rain and blowing hard. When the wind blew my 4x5 camera over on the granite, my fellow assistants and I decided it was time to call it a day and return to the Valley. As soon as we popped out of the Crane Flat tunnel, this fabulous scene of Bridalveil Fall and hanging clouds caused us to screech to a halt. We jumped out of the car with our cameras, and I set up and made this exposure, feeling that “I got it.” Since I was running the darkroom, it was only an hour or two before I was hanging my film up to dry. I DID get it! That was a good week for me!